Library image #3850: Parnoramic view looking west from the top of Cloud Peak. 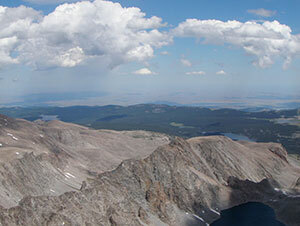 The United States Congress designated the Cloud Peak Wilderness (map) in 1984 and it now has a total of 191,914 acres. All of this wilderness is located in Wyoming and is managed by the Forest Service. This area was managed as the Cloud Peak Primitive Area as far back as 1932 and runs for 27 miles along the spine of the Big Horn Mountain Range, Cloud Peak Wilderness preserves many sharp summits and towering sheer rock faces standing above glacier-carved U-shaped valleys. Named for the tallest mountain in the Bighorn National Forest--Cloud Peak at 13,167 feet--the Wilderness is blanketed in snow for a large part of the year. Most of the higher ground is covered by snow until July. On the east side of Cloud Peak itself, a deeply inset cirque holds the last remaining glacier in this range. Several hundred beautiful lakes cover the landscape and drain into miles of streams. The forest is a mix of pine and spruce opened by meadows and wetlands. The high mountain lakes are the most sensitive to acid rain deposition in the Rocky Mountain Region as monitored and analyzed by lake sampling. Although rugged in appearance, the Bighorns are actually more gentle than other mountains in Wyoming. The area is now visited each year by tens of thousands of backpackers who hike and horse users who ride along more than 100 miles of trails. Planning to Visit the Cloud Peak Wilderness? How to follow the seven standard Leave No Trace principles differs in different parts of the country (desert vs. Rocky Mountains). Click on any of the principles listed below to learn more about how they apply in the Cloud Peak Wilderness.